Homeschooling is a full-time job. Homesteading is also like a full-time job. 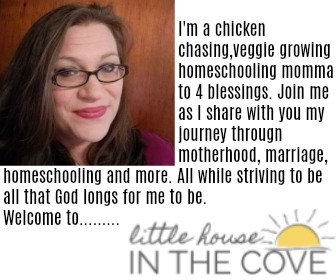 However, here at the Little House in the Cove, we are learning that we can, in fact, succeed in balancing homeschooling and homesteading at the same time if we are diligent with our time and energy. Many thought we were nuts when we announced we would be gardening, introducing poultry on our land and just all around become more self-reliant. For our family, it has been worth the effort. Set yourself up with reasonable expectations: In the very beginning you have tons of dreams. However, starting a homestead is pricey. We are learning that it has to be done slowly. So we have an overall big plan but we have set yearly reasonable expectations. Pull your children in on everything: Homeschooling can happen on a homestead during all the various activities. Anywhere from researching about various seeds, picking out the right chickens for your climate, helping map out the land and more! This allows them to not only take ownership. it provides them with real-life skills and helps encourage them to seek out learning opportunities. Don’t do it all yourself: We are nowhere near done building and adding to our homestead. In fact, we are toward the beginning stages. However, one thing I am learning is that with the husband still working fulltime outside the home, me still working on my online job and homeschooling we have to work as a team. Not one person can do it all. There are days that school ends up being held outside while we work on a patch of land, other times my husband and I spend late nights building in the workshop (another on-site business that is in the beginning stages) and there are times we are up way too early getting our homemaking chores done so we can entertain customers! The fact still remains we are a team not one of us is doing it all. It would not be physically possible! Make sure to take a day off: With this lifestyle, it can be overwhelming most days and yet provide an amazing peace. It is important to remember to take a day off every week. For us, this is on Sundays. The only work that gets done here at the Cove is the feeding of ourselves (leftovers from the week) and feeding the animals. All other productivity stops until after the last church session of the evening and then I will sit down to write down Monday’s to do list. Give yourself grace: Not every day will all the things get done. Have your day set up by order of importance and then work from there, Some days you will get your whole list done and others you will only get 5 or 10 and that is OK! 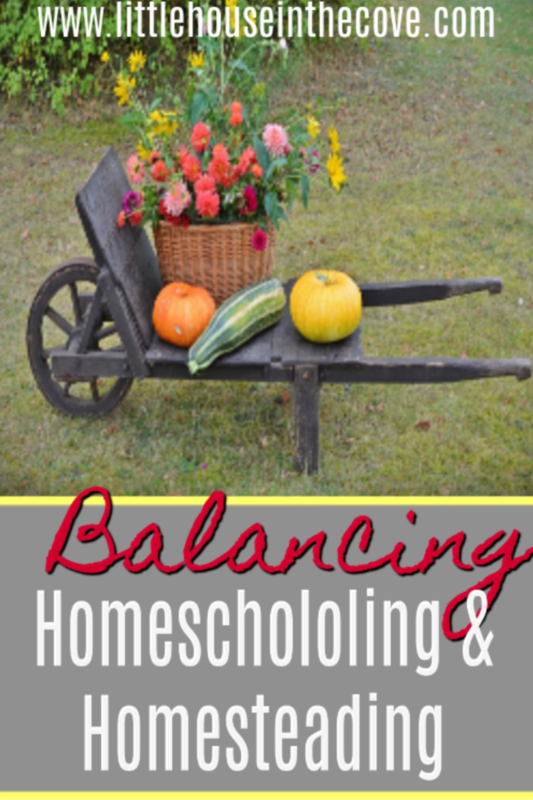 Balancing homeschooling and homesteading is hard work and it is a constant struggle, however, it is doable and it is something that you and your family will grow together from.